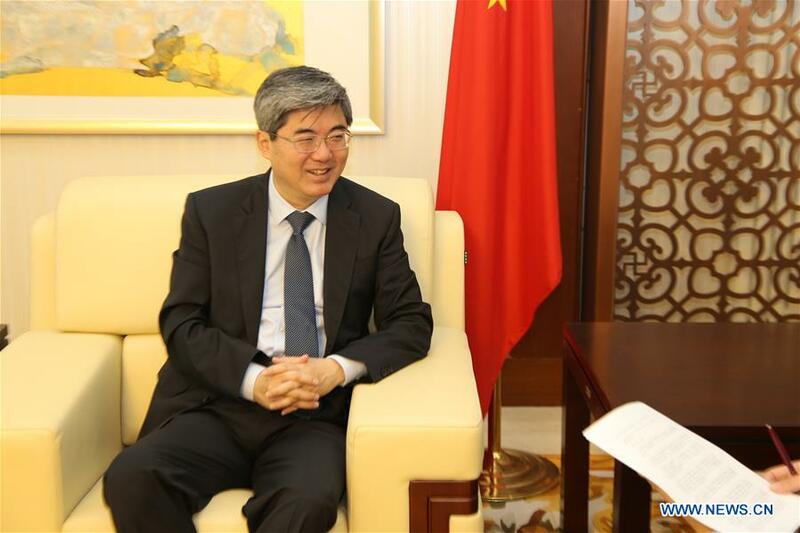 The Central and Eastern European countries (CEEC) are important partners for building Belt and Road, and the "16+1" cooperation is an important part and useful supplement of China-European Union (EU) comprehensive strategic partnership, said Chinese Ambassador to Bulgaria Zhang Haizhou in an interview with Xinhua. Zhang, who made the remarks on the eve of Chinese Premier Li Keqiang's visit to Bulgaria and the seventh leaders' meeting of China and the CEEC, also said the CEE region is the only region in the world that is entirely included in the Belt and Road Initiative. Since the first China-CEEC summit was held in Warsaw in 2012, the "16+1" mechanism has become a multi-layer, multi-field, and multi-track multilateral exchange and cooperation platform with a wide governmental involvement such as state leaders' meeting, ministerial meetings, coordinators' meetings, and local leaders' meetings, the ambassador said. He said as time goes the "16+1" cooperation is going deeper and wider, citing the Budapest-based China-CEEC Association of Tourism Promotion, the China-CEEC Federation of Transport and Infrastructure Cooperation in Serbia, the China-CEEC Joint Chamber of Commerce in Poland, the China-CEEC Center for Dialogue and Cooperation on Energy Projects in Romania, as well as the China-CEEC Association for the Promotion of Agricultural Cooperation in Bulgaria. The trade volume between China and the CEEC reached nearly 70 billion U.S. dollars in 2017 and China's investment in the 16 CEE countries also climbed to nearly 10 billion dollars. In recent years, the CEE countries' economies have been experiencing a period of acceleration and the dazzling performance of many CEE countries had turned them into new engines for the EU economic development, said Zhang. These tangible results showed that "16+1" cooperation fit the industrial characteristics and development needs of the CEE countries and provided a more diversified, mutually complementary trade channel, investment source and financing channel for China and CEE countries, he said. However, Zhang said, since the "16+1" cooperation mechanism came into being, doubts from EU institutions or some member states have never ceased. "I've heard some people claim that the China-CEEC economic and trade cooperation is to split Europe and to weaken the EU's influence on its member countries," he said. "What I want to emphasize is that China's perspective on the China-CEEC cooperation has never broken away from the context of China-EU cooperation. Splitting the EU is not in the interests of China," Zhang stressed. Zhang reaffirmed that the accelerated development of the CEEC would help promote the balanced economic and social development of European countries and be beneficial to the EU as a whole, as well as the European integration. China's policy of supporting European integration was clear and consistent, he said. China welcomes the active participation of relevant parties, including the EU, in the "16+1" cooperation, and attaches great importance to the trilateral cooperation among the EU, the CEEC and China, he said, adding the EU, as an observer, has already participated in various activities within the "16+1" cooperation framework. However, Zhang said, the level of the China-CEEC cooperation in the economic and trade field still lags far behind the average level of the China-EU cooperation. The "16+1" cooperation still faces problems of one kind or another in project financing, market access, market operation and legal arbitration, among others, he said. This is inconsistent with the traditional friendship between China and the CEE countries, their huge potential for development, and especially their strong desire for cooperation, Zhang said. The Chinese ambassador said this year is the fifth anniversary of the Belt and Road Initiative, the 40th anniversary of China's reform and opening-up and the 15th anniversary of the establishment of China-EU comprehensive strategic partnership. This week, Premier Li will sit down with CEEC leaders in Sofia and push forward the deepened development of the "16+1" cooperation, Zhang said. The meeting will be a great success and yield substantial results, he believed. As for the ties between China and Bulgaria, Zhang said Bulgaria is not only one of the first countries in the world which recognized the People's Republic of China, but also one of the first countries which signed the Memorandum of Cooperation on the Belt and Road Initiative with China. During the upcoming visit, Premier Li will meet with Bulgarian President Rumen Radev and hold talks with Bulgarian Prime Minister Boyko Borissov. Several cooperative documents between the two governments and business sectors will be signed during the visit. Zhang believed that Premier Li's official visit to Bulgaria will bring the bilateral relations between China and Bulgaria to a new stage.